To reduce the use of antibiotics in animal agriculture, a number of effective or commercially viable alternatives have been implemented by food animal producers or are under development. Perhaps the most well-established strategies are flock and herd management practices to mitigate disease introduction and spread, and, subsequently, reduce the need for antibiotic use.While vaccines in food animal production have been used to prevent both bacterial and viral diseases, but historically, most vaccines have targeted viral diseases. Though vaccines against viral diseases can help reduce the need for antibiotic use by controlling the spread of secondary bacterial infections, more recent vaccines under development specifically target bacteria. New developments in selecting and potentially tailoring bacteriophages provide a promising avenue for controlling pathogenic bacteria without the need for traditional small-molecule antibiotics. 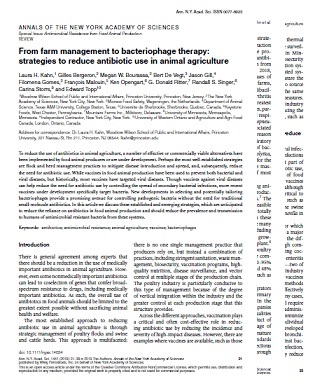 In this article we discuss these established and emerging strategies, which are anticipated to reduce the reliance on antibiotics in food animal production and should reduce the prevalence and transmission to humans of antimicrobial resistant bacteria from these systems. There are numerous avenues of research into antibiotic alternatives, some of which are described in this article. Perhaps the greatest excitement surrounds the potential application of bacteriophage based therapy in animal agriculture, as is currently available for food safety and processing applications. Bacteriophages (or phages) are viruses that specifically infect bacteria; they can rapidly and efficiently kill their bacterial targets while simultaneously growing in numbers. This therapy would have numerous advantages over antibiotics; in particular, it would be safe for humans and the environment, and any resistance that emerges might be easier to manage than AMR from antibiotic use. 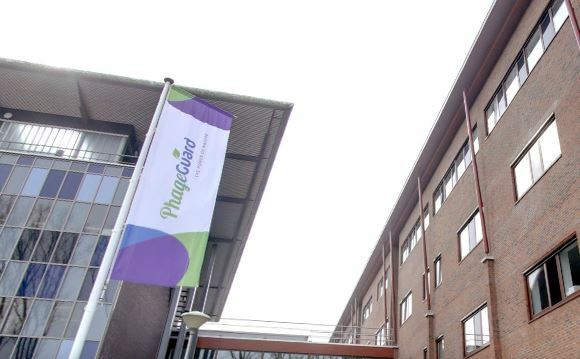 However, phage research is largely confined to academic settings, as many biotechnology companies may be wary of getting involved because of potential uncertainties about profitability and how to deploy them most effectively. Like vaccine development, it will likely be necessary for governments to incentivize the development of phage-based therapies for animal agriculture. This article will discuss how strategies to reduce antibiotic use in animal agriculture are being employed and the ongoing research into improving their utility. Our discussion is largely based on presentations at and deliberations of the integrated discussion group at the conference “Minimizing the Risk of Antimicrobial Resistance fromFood Animal Production,” hosted by the New York Academy of Sciences on May 8 and 9, 2018. Click here to view the .PDF version of this publication, or continue reading below. An effective way to reduce the risk of antibiotic resistance is to reduce the use of antibiotics in animal agriculture.2 However, limiting antibiotic use may lead to increased incidence of disease if this is done without adding necessary strategic mitigation strategies that reduce introduction and transmission of disease. Indeed, as the proportion of broiler chickens raised without antibiotics (RWA) in the United States has grown from less than 10% in 2014 to nearly 50% in 2018, there has been a rise in the number of cases of enteric and respiratory diseases on poultry farms, including coccidiosis, clostridial enteritis, colibacillosis, and Staphylococcus-associated osteoarthritis and osteomyelitis.3 On swine farms, the greatest threats to animal health are respiratory diseases, particularly influenza, porcine reproductive and respiratory syndrome(PRRS), andMycoplasma hyopneumoniae; secondary bacterial infections associated with these diseases are also the most commonreason for antibiotic use.4 Similarly, the bovine respiratory disease (BRD) complex includes a variety of bacterial pathogens, notably Mannheimia haemolytica, which results in important economic losses for the cattle industry.5 For milk producers, bovine mastitis is the costliest disease and the cause of most antibiotic use.6 To reduce antibiotic use while maintaining animal health and welfare, veterinarians and producers employ numerous management strategies.7 The application of these strategies is particularly feasible in the poultry industry because it is almost totally vertically integrated in the United States. In these systems, one company owns and oversees the many stages of large-scale poultry production, including feed mills and from breeding to hatchery to growout farm(for broiler chickens) to processing plant.8 The components of a vertically integrated poultry operation are referred to in total as a broiler complex. For example, in the United States, 90–95% of broiler and breeder farmers of poultry and 48% of pigs are contracted by large integrators such as Tyson Foods and Smithfield, respectively.9 In a vertically integrated system, integrators receive day-old breeding stock from the primary breeder companies (genetics companies). In the case of poultry, the primary breeder companies supply different strains of birds that have qualities considered important to the finished product of the integrated broiler complex. At this stage of production, the goal is to raise the immature breeding stock according to production standards and for the animals to remain free of infectious diseases.10 Disease control is accomplished through multiple measures including vaccination programs, disease surveillance, sanitation, waste removal, and biosecurity in order to restrict the introduction and spread of pathogens onto and within farms.11 When the immature breeders reach sexual maturity, they are moved to breeder farms where they produce fertile hatching eggs. The same management practices are used on breeder farms tomitigate disease occurrence. Additionally, key to limiting the amount of bacterial contamination that is passed from the breeder farm to the hatchery and, ultimately, to the broiler farm is ensuring that hatching eggs are properly handled and stored to limit bacterial contamination and subsequent bacterial bloom that can occur after hatching eggs are transferred to the hatchery for incubation and hatch. Hatcheries take similar measures to reduce disease challenge, including sanitation, vaccination of broiler chicks, and pest management. Shortly after hatching, the broiler chicks are transported to grow-out farms where they are raised to the target weight and subsequently taken to processing plants.10 Whether on breeder or broiler farms, strategies are employed to reduce stress on the animal. Several strategies include the provision of a high plane of nutrition by using high-quality feed ingredients in diets that are formulated to optimize the birds’ health and performance and by maintaining an optimal environment, including focusing on specific air quality, bedding material, and ambient temperature parameters.7 As mentioned above, vaccination is important for controlling many poultry diseases, and it is increasingly used to reduce coccidiosis on grow-out farms, particularly as more farms move toward RWA production.12 Dependence on alternative and/or ancillary ingredients, including organic acids, phytogenics, probiotics, enzymes, and minerals, is also becoming more common as RWA programs become more common. There are many parallels between the poultry and swine industries in methods of flock/herd disease management. However, the latter has much less extensive vertical integration, and thus there is less consistent and programmed control over disease management methods.13 Analogous to the poultry industry, the swine industry has made an extensive effort in the last 10 years to eliminate pathogens from the breeding stock by use of measures such as providing high-quality feed (particularly for recently weaned pigs), maintaining a hygienic environment and appropriate thermal control, and using biosecurity and disease surveillance methods. For example, pig farms in Minnesota and Iowa have increased their biosecurity measures by investing heavily in air filtration systems. Though lacking a vertically integrated system, the pig industry is attempting to ensure the health of animals by intensifying efforts to source all the pigs in a grow-out facility from the same breeder employing high-level biosecurity measures. 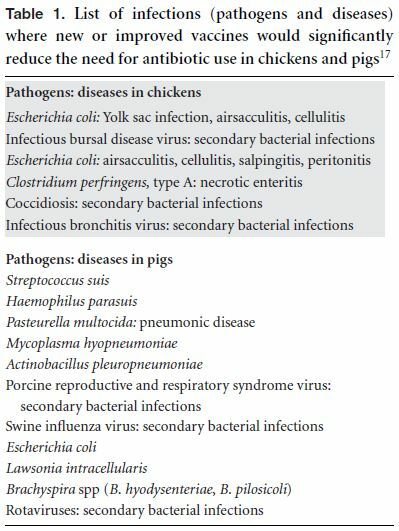 And as in the poultry industry, in the pig industry vaccination programs are critical for reducing the incidence of certain high-impact diseases, such as M. hyopneumoniae. Vaccines that prevent either bacterial or viral infections that lead to secondary bacterial infections should become an increasingly important part of a multifaceted approach to reduce antibiotic use, while protecting the health and welfare of food animals.14–16 Currently, the majority of vaccines used in animal agriculture are antiviral, although some antibacterial vaccines are already critical to healthy and productive farming practice, such as vaccines against M. hyopneumoniae in the swine industry and against Salmonella and Pasteurella in the poultry industry. There are several bacterial pathogens for which new or more effective vaccines could have a major impact on reducing antibiotic use across the different animal agriculture groups. Although commercial vaccines are available for managing coccidial infection and subsequent clostridial enteritis and Escherichia coli infections in chickens—two of the most critical pathogens in the poultry industry and main reason for antibiotic use—these vaccines are not consistently efficacious, and the methods for administering vaccine efficiently and effectively against coccidia are not optimized.17 In many cases, improving vaccine efficacy in chickens will require improving technologies for vaccine mass administration, as poultry veterinarians prefer to immunize eggs or chicks in large batches rather than individual animals. If more effective vaccines were developed against viral diseases, such as infectious bronchitis and infectious bursal disease, and against bacterial infections secondary to coccidiosis infection, such as clostridia, this would significantly reduce antibiotic use in chickens, according to a 2015 report by a working group convened by the World Organization for Animal Health (OIE).17 The OIE report also concluded that new or more effective vaccines against the following pathogens would have a high impact on reducing antibiotic use in the swine industry: Streptococcus, Haemophilus, Pasteurella, M. hyopneumoniae, Actinobacillus, E. coli, Lawsonia, Brachyspira, and bacterial infections secondary to PRRS, influenza, and rotavirus (Table 1).17 Because of the importance of secondary bacterial infections, antiviral vaccines against PRRS and influenza in pigs would also be highly beneficial (though their development is challenging because of high genetic variability of these pathogens). In the dairy industry, new and improved vaccines against bacterial pathogens that cause mastitis, such as Staphylococcus, Streptococcus, and E. coli, would have enormous benefit, as mastitis is the most common reason for administering antibiotics in these animals and is the most costly disease to dairy farms.18,19 Additionally, there would be tremendous benefit to having an effective vaccine against the parasites that cause anaplasmosis, which has becomea substantial problem in the cattle industry.20 There are several challenges that need to be overcome in order to develop new vaccines,1 however. For one, there are currently no models for predicting whether a new vaccine will be profitable considering the substantial research and development costs. For another, there are expectations among stakeholders that vaccines must be completely effective and prevent all cases of disease; but in reality, livestock vaccines that significantly reduce disease prevalence would make an important contribution to a farm’s profit margin,21 especially in cases where using antibiotics to control disease is not economically effective. As restrictions on antibiotic use and concerns for animal welfare grow, there likely will be greater acceptance of vaccines (even partially effective ones) and increased pressure to develop them; the resulting market competition could drive down production cost.16 In addition to vaccines, a range of biologic agents and natural products are being utilized in animal agriculture with the goal of modulating immune responses and reducing disease prevalence.22–24 Using antibodies for passive immunization has attracted much interest, particularly for the prevention of enteric diseases. Although mammalian-derived antibodies are often prohibitively expensive, chicken egg yolk antibodies could be cost-effective, and studies suggest they could prevent and control diseases such as bovine rotavirus and coronavirus.18,25,26 There are also nonspecific biologic agents that elicit innate immune responses. ImrestorTM, which was approved by the U.S. Food and Drug Administration (FDA) in 2016, is a modified bovine neutrophil stimulating factor that enhances an innate immune response to prevent mastitis in dairy cows.27 Similarly, Zelnate R _ is a DNA–liposome complex that induces innate immunity and reduces the prevalence of M. haemolytica, a causative agent of BRD, a leading cause of death and disease in cattle worldwide.28 Among the myriad natural products being employed are essential oils, such as carvacrol and eugenol, that act as anti-infectives and immunomodulators. Other products such as medium chain fatty acids often meet the requirements for FDA “generally recognized as safe” (GRAS) designation,29 however, it has been difficult to demonstrate the effectiveness of these products, and there are questions regarding dosing and effective delivery to specific areas within the body.29 Overall, biologic agents and natural products are likely not as cheap, easy, efficacious as antibiotics, which thus far has hindered their acceptance by the farming community. Research on the use of phages in animal agriculture has intensified particularly in the last 20 years. Multiple studies have explored the use of phages against Salmonella, pathogenic E. coli, Clostridium, and Campylobacter for the poultry industry and against Salmonella and pathogenic E. coli for the pig industry. To advance phage research, it will be necessary to move from the current, purely empirical mode toward a more systematic phage discovery approach that relies on a set of characteristics, such as phage size, phage class, or receptor usage, which could predict the best phage-based drug candidates. There are also many unknowns concerning the interaction of phages with a given host’s immune system and the pharmacokinetics of phages.38 Future research is needed in these areas to help inform the development and design of phage-based therapy. As more phages are isolated from the environment and characterized, and as phage libraries are expanded, the research field may increasingly move toward engineering phages by starting with a so-called “platform” phage and genetically modifying it to have certain properties.39 There are early indications that the FDA would not evaluate such genetically modified phages differently from other, naturally occurring phages. Another important issue in phage research is determining the diseases that represent the most feasible targets for phage-based therapy. Phages generally have a very narrow range of activity against a single bacterial species, more typically against a subset of strains within a species, which means careful planning must occur in the development of a phage product if it is to have activity against most or all strains of a pathogenic species. An alternative would essentially be precision medicine for animal agriculture, that is, adopt similar approaches to how phages are being studied, and increasingly used experimentally, in human medicine.40,41 A precision medicine model would, however, be a significant departure from how antimicrobials are currently used in food-animal industry. In either case, the specificity of a given phage influences the choice of target for phage applications. For example, infections that are caused by genetically homogeneous pathogens such as L. monocytogenes, or a single bacterial serotype such as E. coli O157:H7, are more attractive phage-therapy candidates, whereas a disease such as BRD would be more challenging to treat using phages because BRD can be caused by multiple bacterial pathogens. Currently, as mentioned above phages are most commonly used in food safety for controlling Listeria and E. coli O157:H7. On the other hand, the specific antibacterial activity of phages has certain advantages, including not killing beneficial bacteria and resistance development that would only arise in the target bacteria, thus avoiding cross-resistance. Bacteria develop resistance to phages at fairly high rates of about 1 in 106 to 1 in 108 bacterial cells, depending on the phage (similar to the rates bacteria can develop resistance to certain antibiotics, such as streptomycin). A common mechanism of resistance is the loss of the bacterial surface feature (receptor) that the phage uses to recognize and adsorb to the cell.42 However, this can be circumvented by developing a cocktail of phages that use different receptors, as spontaneous mutation and loss of multiple receptors is comparatively less probable, and, in addition, bacteria may become less fit as they lose surface features.33 In addition, bacteria can carry anti-phage defense mechanisms, such as restriction-modification–, toxin-antitoxin–, and CRISPR-Cas–based systems.33,42 However, phages can still be active against bacteria with such defense systems because in many cases the initial phage infection event is fatal to the bacterial cell, even if the phages are unable to replicate and lyse their host. As such, it is important to consider resistance in the context of phage-based agents as the inability of a phage to kill its target strain, rather than the traditional definition of lack of plaque formation,43 This definition is relevant in phage applications, where replication of the phage is not required to effect significant bacterial reductions because the number of phages is greater than that of the target bacterial cells to such a degree that essentially all of the accessible cells are infected shortly after application. Such a situation might occur in the treatment of surface bacterial contamination (e.g., hides, foods, or equipment) with a phage preparation sufficient to infect every bacterial cell, and where the treatment site is fully exposed and contact time is limited. Calculations used in phage biocontrol on foods44 may become relevant for such applications as well. Despite efforts to reduce their use, antibiotics cannot currently be avoided in cases of serious illness, such as secondary bacterial infections following PRRS infection on pig farms and during certain stages of food animal production. For example, antibiotic administration is critical in neonatal pigs to avoid septicemia and infections related to castration and tail docking. Indeed, even Denmark and Holland, which have surpassed other countries in reducing antibiotic use in animal agriculture, still rely on antibiotics in these settings. Additionally, in newlyweaned pigs (3–4weeks of age) antibiotics are administered to reduce opportunistic infections, such as E. coli, Actinobacillus, and Mycoplasma, which are difficult to control through biosecurity measures. Reducing the use of antibiotics in food animals will undoubtedly demand a multifaceted approach. Established practices within flock and herd management, including environmental and nutritional optimization, biosecurity, sanitation, and disease surveillance, are critical and must be expanded, particularly in the swine and cattle industries where vertical integration is less extensive than in the poultry industry. The development and utilization of emerging approaches, from new and more effective vaccines to potential phage-based therapies, will likely complement these practices. However, due to the present high cost and uncertainties related to profitability and market acceptance of vaccine and phage-based products, it will likely be necessary for the United States and other governments worldwide to incentivize their development, and possibly subsidize their use. Ultimately, however, reducing the risk of antibiotic resistance due to animal agriculture cannot rely solely on reducing the use of antibiotics in food animals. There are examples of antibiotic resistance even on farms within RWA operations. It is critical for producers, farmers, and veterinarians, therefore, to assess the background buildup of antibiotic resistance; yet these types of surveillance systems are not currently in place. B.D.V. is employed byMicreos Food Safety, a phage and endolysin technology development company. K.O. is employed by Keystone Foods, a company that supplies animal protein products worldwide. G.D.R. is an employer of Mountaire Farms, a chicken production company. F.M. received support from Bayer Animal Health and Elanco Animal Health. J.G. is currently a member of the scientific advisory council of the National Pork Board, which is interested in antibiotic use and resistance in swine production. R.S.S. received funding from the Animal Agriculture Alliance, Elanco Animal Health, Zoetis, and Bayer Animal Health. All the other authors declare no competing interest. U.S. Department of Health and Human Services. 2017. Recommendations for incentivizing the development of vaccines, diagnostics, and therapeutics to combat antibioticresistance. Tang, K.L., N.P. Caffrey, D.B. N´ obrega, et al. 2017. Restricting the use of antibiotics in food-producing animals and its associations with antibiotic resistance in food-producing animals and human beings: a systematic review and metaanalysis. Lancet Planet. Health 1: e316–e327. Cervantes, H.M. 2015. Antibiotic-free poultry production: is it sustainable? J. Appl. Poult. Res. 24: 91–97. Penrith, M.-L. 2018. High impact diseases—fact sheet. 5. Griffin,D., M.M. Chengappa, J. Kuszak, et al. 2010. Bacterial pathogens of the bovine respiratory disease complex. Vet. Clin. North Am. Food Anim. Pract. 26: 381–394. Aghamohammadi, M., D. Haine, D.F. Kelton, et al. 2018. Herd-level mastitis-associated costs on Canadian dairy farms. Front. Vet. Sci. 5: 100. Thornton, G. 2015. WATTAgNet 2015. Accessed March 10, 2018. https://www.wattagnet.com/articles/24679-keysto-antibiotic-free-poultry-production. Clauer, P. 2011. A small overview of the modern commercial poultry industry. Accessed February 16, 2019. https://extension.psu.edu/commerical-poultry-industry. WennerMoyer,M. 2016. How drug-resistant bacteria travel from the farm to your table. Sci. Am. Accessed February 16, 2019. https://www.scientificamerican.com/article/how-drugresistant-bacteria-travel-from-the-farm-to-your-table/. US Poultry and Egg Association. 2018. Introduction to thepoultry industry. American Veterinary Medical Association. 2018. Accessed February 16, 2019. https://www.avma.org/KB/Policies/Pages/AAAP-Guidelines-to-Judicious-Therapeutic-Use-of-Antimicrobials-in-Poultry.aspx. O’Keefe, T. 2018. WATTAgNet 2018. Accessed March 10, 2018. https://poultryhealthtoday.com/antibiotic-freebroiler-production-requires-paradigm-shift-2/. Martinez, S.W. 2002.Vertical coordination ofmarketing systems: lessons from the poultry, egg, and pork industries. The Pew Charitable Trusts. 2017. Alternatives to antibiotics in animal agriculture. Clift, C. & D.M. Salisbury. 2017. Enhancing the role of vaccines in combatting antimicrobial resistance. Vaccine 35: 6591–6593. Roth, J.A. 2011. Veterinary vaccines and their importance to animal health and public health. Procedia Vaccinol. 5: 127–136. OIE. 2015. Report of the meeting of the OIE ad hoc group on prioritisation of diseases for which vaccines could reduce antimicrobial use in animals. Paris. Ismail, Z.B. 2017. Mastitis vaccines in dairy cows: recent developments and recommendations of application. Vet.World 10: 1057–1062. Erskine, R.J. 2018. Merck veterinary manual 2018. https://www.merckvetmanual.com/reproductive-system/mastitisin-large-animals/mastitis-in-cattle. The Cattle Site. 2014. Cattle disease guide 2014. Accessed February 16, 2019. http://www.thecattlesite.com/ diseaseinfo/255/anaplasmosis/. Meeusen, E.N.T., J. Walker, A. Peters, et al. 2007. Current status of veterinary vaccines. Clin. Microbiol. Rev. 20: 489–510. Nicholls, E.F., L. Madera & R.E.W. Hancock. 2010. Immunomodulators as adjuvants for vaccines and antimicrobial therapy. Ann. N.Y. Acad. Sci. 1213: 46–61. Zeng, Z., S. Zhang, H. Wang, et al. 2015. Essential oil and aromatic plants as feed additives in non-ruminant nutrition: a review. J. Anim. Sci. Biotechnol. 6: 7. Yang, C., M.A.K. Chowdhury, Y.Hou, et al. 2015. Phytogenic compounds as alternatives to in-feed antibiotics: potentials and challenges in application. Pathogens 4: 137–156. Marquardt, R.R. & S. Li. 2018. Antimicrobial resistance in livestock: advances and alternatives to antibiotics. Anim. Front. 8: 30–37. Diraviyam,T., B. Zhao,Y.Wang, et al. 2014. Effect of chicken egg yolk antibodies (IgY) against diarrhea in domesticated animals: a systematic review and meta-analysis. PLoS One 9: e97716. Vogel, J. 2016. New immunity-booster from Elanco reduces dairy mastitis risk. American agriculturist 2016. https://www.farmprogress.com/story-new-immunitybooster- elanco-reduces-dairy-mastitis-risk-13-140770. Ilg, T. 2017. Investigations on the molecular mode of action of the novel immunostimulator ZelNate: activation of the cGAS-STING pathway in mammalian cells. Mol. Immunol. 90: 182–189. Omonijo, F.A., L. Ni, J. Gong, et al. 2018. Essential oils as alternatives to antibiotics in swine production. Anim. Nutr. 4: 126–136. Gill, J.J. & P. Hyman. 2010. Phage choice, isolation, and preparation for phage therapy. Curr. Pharm. Biotechnol. 11: 2–14. Nilsson, A.S. 2014. Phage therapy—constraints and possibilities. Ups J. Med. Sci. 119: 192–198. Br¨ussow, H. 2005. Phage therapy: the Escherichia coli experience. Microbiology 151: 2133–2140. MICREOS. 2016. Accessed February 16, 2019. https://www.phageguard.com/listeria-solution/. FDA. 2018. GRAS notice inventory 2018. Accessed February 16, 2019. https://www.fda.gov/Food/Ingredients PackagingLabeling/GRAS/NoticeInventory/default.htm. Carvalho, C., A.R. Costa, F. Silva, et al. 2017. Bacteriophages and their derivatives for the treatment and control of foodproducing animal infections. Crit. Rev. Microbiol. 43: 583–601. Wernicki, A., A. Nowaczek & R. Urban-Chmiel. 2017. Bacteriophage therapy to combat bacterial infections in poultry. Virol. J. 14: 179. Gill, J.J., T.Hollyer & P.M. Sabour. 2007. Bacteriophages and phage-derived products as antibacterial therapeutics. Expert Opin. Ther. Pat. 17: 1341–1350. Drulis-Kawa, Z., G. Majkowska-Skrobek, B. Maciejewska, et al. 2012. Learning from bacteriophages — advantages and limitations of phage and phage-encoded protein applications. Curr. Protein Pept. Sci. 13: 699– 722. Kilcher, S. & M.J. Loessner. 2018. Engineering bacteriophages as versatile biologics. Trends Microbiol. https://doi.org/10.1016/j.tim.2018.09.006. Schooley, R.T., B. Biswas, J.J. Gill, et al. 2017. Development and use of personalized bacteriophage-based therapeutic cocktails to treat a patient with a disseminated resistant Acinetobacter baumannii infection. Antimicrob. Agents Chemother. 61. https://doi.org/10.1128/ AAC.00954-17. Chan, B.K., P.E. Turner, S. Kim, et al. 2018. Phage treatment of an aortic graft infected with Pseudomonas aeruginosa. Evol. Med. Public Health 2018: 60–66. Seed,K.D. 2015. Battling phages: howbacteria defend against viral attack. PLoS Pathog. 11: e1004847. O¨ rma¨la¨, A.-M.&M. Jalasvuori. 2013. Phage therapy: should bacterial resistance to phages be a concern, even in the long run? Bacteriophage 3: e24219. Hagens, S. & M.J. Loessner. 2010. Bacteriophage for biocontrol of foodborne pathogens: calculations and considerations. Curr. Pharm. Biotechnol. 11: 58–68. Schmelcher, M., A.M. Powell, M.J. Camp, et al. 2015. Synergistic streptococcal phage _SA2 and B30 endolysins kill streptococci in cow milk and in a mouse model of mastitis. Appl. Microbiol. Biotechnol. 99: 8475–8486. The Poultry Site. 2014. New antimicrobial guidelines stress judicious use. Accessed February 16, 2019. http://www.thepoultrysite.com/poultrynews/34009/newantimicrobial- guidelines-stress-judicious-use/. National Pork Board. 2013. Updating the Pork Quality Assurance Plus Program. Accessed February 16, 2019. https://www.nationalhogfarmer.com/resources/updatingpork-quality-assurance-plus-program. Ann. N.Y. Acad. Sci. 1441 (2019) 31–39 C_ 2019 The Authors. Annals of the New York Academy of Sciences published by Wiley Periodicals, Inc. on behalf of New York Academy of Sciences.